Every Complete Teacher's Kit contains three title-specific literature teaching resources that help you teach a work of literature. Whether your students learn best through a traditional approach, by completing fun and interesting activities, or by crafting personal responses to literature, Complete Teacher's Kits give you the resources to reach them, and when you buy a Complete Teacher's Kit with 30 paperbacks, we'll automatically upgrade those paperbacks to our biggest discount—35% off! 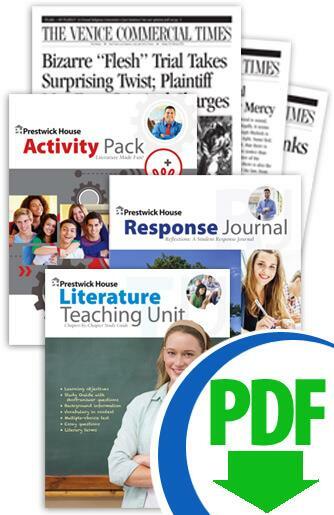 Note: Downloadable Complete Teacher's Kits do not include Headlines posters. Whether you're looking for a classic like The Great Gatsby or an emerging favorite like Life of Pi, you'll find the largest selection of Complete Teacher's Kits at Prestwick House.